Portland has undergone such rapid changes within the past several years that the city is struggling to keep up with itself. As the Pacific Northwest continues to grow in popularity in the technology sector and Portland’s economy booms, the demand for new construction has steadily climbed. While this growth seems to be good news within itself, there’s one small problem: skilled labor shortages. There is an abundance of open construction jobs in Portland but not enough of an available workforce to fill them. According to John Killin, the Executive Director of Associate Wall and Ceiling Contractors of Oregon and Southwest Washington, the gap is staggering. “There are probably 10,000 open jobs out there,” Killin said. Both the carpentry and electrical trades have around 800 positions open each. In addition to those vacancies, there are approximately 20 trades that have a shortage in the labor force. The big question is why labor shortages have affected the PDX construction market in such a large way. Popular explanations range from new permit ordinances, repercussions of the 2008 housing bubble, as well as sharply rising prices in both residential and commercial real estate. 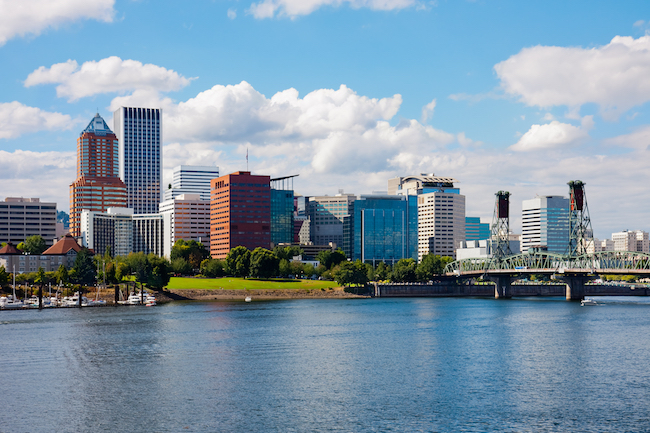 Only time will tell how the Rose City will fare from its mix of growth and labor shortages. Portland has undergone many changes within recent years that have contributed to its expansion. Tourism has exploded in Portland. Its upward trend has been fueled by a strong art culture, popular restaurants, niche coffee and craft beer markets, and even the television show Portlandia. The popularity of the city isn’t exclusive to the public either. Various tech companies have decided to set up shop in PDX. The interest of technology driven companies has necessitated the need for construction of new office spaces. Opportunities for other businesses that can cater to them have also contributed to the influx. This has created a wave of individuals coming to Portland looking to hop on board these new tech job opportunities. Another driving factor has been residents from more expensive markets arriving to take advantage of the relatively cheaper real estate market of Portland. One demographic that has consistently continued to climb is individuals who previously resided in California. Ironically, this has led to a competitive housing market and rising real estate prices and expenses. One of the industries that have benefited from Portland’s exponential growth has been heavy equipment rental. With a rush on completing large-scale development projects, there is a large demand for pieces of equipment like cranes, boom lifts, and scissor lifts. Rising popularity and renewed interest in a city makes for easy growth, right? That hasn’t necessarily proved to be the case for Portland. The University of Oregon sought to conduct a $70 million update of their Hayward field. However, when the (very) few bids for the project came in, they were significantly higher than the university had anticipated. Contractors were simply too busy. Every shortage has its initial source. The 2008 recession and burst of the housing bubble had severe consequences on both the construction and real estate fields. According to labor statistics, the working-age population in these professions declined about 40 percent. This decline has led to the remaining workforce in construction working 6 or 7 days a week. As a result, the unemployment rate in this field is exceedingly low. This availability of jobs but a lack of workers to fill them is consistent with other booming construction markets. In an international survey, a shared trend among the most lucrative markets was that skilled labor in construction has been facing a major deficit. Recruiting has been up, but there has been little to show for it in relieving construction labor shortages in Portland. Construction industry veterans have cited the sentiment that the next generation shows a declining interest in construction related jobs. Another factor is the stripping of vocational classes from the public school system. According to Brad Avakian, Oregon’s Labor Commissioner, many young people setting out in their careers neglect the fact that they can earn “$60,000 to $150,000 with benefits” a year in these jobs. The aforementioned recruiting has filled hundreds of apprenticeship positions in fields such as electrical and plumbing, but it simply is not enough. Unsurprisingly, the shortage of skilled construction workers has led to some very real issues in Portland’s real estate market. A lack of available laborers has led to higher costs in all aspects of the industry. The increase in price hasn’t meant an increase in quality, either. Overworked contractors have resulted in properties with declining quality, according to Portland-area developers. Multi-family housing has been especially hard-hit by the shortage. Portland faces low rental availability and vacancies for desirable, affordable rentals. The average cost of a one-bedroom unit in Portland is $1,116/month. While this may sound affordable to renters from more expensive markets (like California or New York), Portland’s rent has outpaced the growth of its wages. This discrepancy is underscored by the city’s gradually increasing homeless population. Rising prices aren’t exclusive the rental market. Prices have grown significantly for both renters and buyers in real estate since 2010. The Portland City Council has tried to remedy these high prices and housing shortages with a policy necessitating that developers with projects greater than 20 units allocate 20 percent to be available to low-income applicants. Real estate workers worry what effect this reaction by the local government will have on the housing shortage. Subsidizing rent for lower-income units has the potential to lead to higher rent for other units within a project. Another concern is the fact that, at the current rate of growth, Portland will not have enough housing for its population by 2020. If Portland wishes to resolve the issues caused by a lack of construction workers for its development, proactive measures will have to be taken. Anything less has the potential to induce a burst of its real-estate market, much like the nationwide occurrence during the Great Recession in 2008. As a thriving, colorful city, it is the hope of many that Portland can avoid this fate.